LED Christmas lights are bright, energy efficient, and will last a long time. You'll save about 80% on electricity costs versus traditional lights. 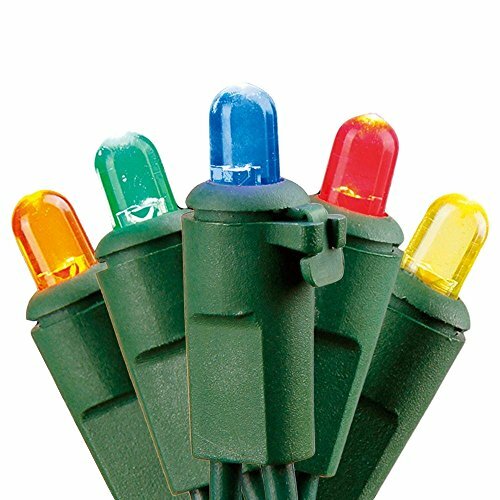 50 multi-color dome lights, green wire. Up to 25 000 hours bulb life, covered by 3 year manufacturer warranty. Can be used indoors or outdoors. Total length of the set is 18.6 feet, lighted section is 16.3 feet. Up to 43 sets can be connected end-to-end in sequence, circuit is overload-protected by fuse, which is integrated into power plug. Uses only 4.8 Watts of electricity (0.04Amps). Cool to touch. Energy star certified. 2 spare LED bulbs included.